I’ve been experimenting on and off with black and white photography for a few years now, but I was recently “inspired” by Amy Saab’s blog post “The Roses Had Spots” to set up a series of swaps in the “A Thousand Words” group on swap-bot. There are a number of photography groups on swap-bot. I belong to three or four. This group is different in that it requires photographers to be at least “intermediate” level and capable of crafting more sophisticated or thoughtful swaps using photos–beyond the simple “snap a shot and send it.” We’re a small group by swap-bot standards, but many of the members are serious hobbyists who may have taken a class or two or who have sold their photographic work at craft shows or in online shops. The idea is to challenge each other to grow and provide constructive feedback when necessary. In her post, Amy Saab shared “flawed” roses in black and white. She “removed the color to show their beautiful structure.” I’ve done the same thing with “flawed” photos of flowers, buildings, people, and other subjects. Even without “imperfections,” black and white photography reveals beauty in ways that we often miss because of all the color. Don’t get me wrong. I love the brilliance of color photography, but an image composed in black and white can be breathtaking. So far, I’ve hosted three “black and white” (or monochrome) swaps–in October, November, and December 2014. Instead of showcasing the photographs in one blog post, I will share the photos in three separate posts. The first swap in the series was “Flowers in Black and White.” Swappers were to alter photos of flowers already in their collections and select what they consider the best two and send the B&W photos to their partners. They were encouraged, but not required, to send the color photos as well. My partner, “Midteacher,” sent four sets. I’m sharing two because the other two are either buried under my desk clutter or are sitting in the collection of notecards I keep at work just in case I get the urge to write a note or letter during a break. Purple is my favorite color and I love seeing purple in nature, but I’m having a difficult time staying loyal to purple in this instance. The sunflower is stunning in black and white, especially with the added texture that doesn’t show up so well in the scan below. I sent my partner four sets of flowers in B&W. Two that appear in earlier posts–dogwood blossoms and daisies–and one that will be featured in a future post, so I’ll share only one of them here. I shot this one in color some time during Fall 2013. The original color image also appears in an earlier post. It was one of the images I used to make a postcard for International Women’s Day 2014. The B&W photo was a bit “blah,” so I used sepia instead. I captured the water lily while on a Mother’s Day visit to the New Orleans Botanical Gardens. The lavender flower was my favorite shot of the day. I like the photo in B&W, but I love the color one. I found the bright orange and yellow flower while taking a walk one summer day. Here are two bonus postcards Beckra (RR) sent. “Blackberry Blossom,” by Beckra (RR). Beckra and I were on the same photographic page when I put the swap together. She had just ordered these B&W postcards when she read the swap description, so she decided to share them with me. I always appreciate her photographic interpretation of her world. I’ll post the second part, “Black and White with a Touch of Color,” tomorrow. 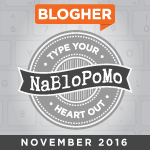 Oh, my hubby has finally joined the blogosphere here on WordPress. While you anxiously wait for my next post, head over to his page and show him some blog love. 🙂 Find him here: Viewfinder.